The challenges faced by individuals and families at the end of life are still incredibly diverse, and many behavioural interventions and clinical approaches have been developed to address this great diversity of experiences in the face of dying and death, helping providers to care for their clients. Perspectives on Behavioural Interventions in Palliative and End-of-Life Care is an accessible resource that collates and explores interventions that can be used to address a wide range of behavioural, psychological, social and spiritual issues that arise when people are facing advanced chronic or life-limiting illness. Interventions embracing cultural diversity and intersectionality. 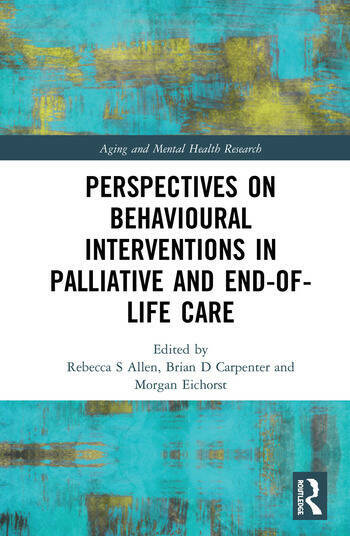 Together with Perspectives on Palliative and End-of-Life Care: Disease, Social and Cultural Context, the book provides a foundation for collaborative international and interprofessional work by providing state-of science information on behavioural interventions addressing mental health and wellness. It is of interest to academics, researchers and postgraduates in the fields of mental health, medicine, psychology and social work, and is essential reading for healthcare providers and trainees from psychosocial and palliative medicine, social work and nursing. Rebecca S. Allen is Professor of Psychology at the Alabama Research Institute on Aging and the Department of Psychology, the University of Alabama, USA. Brian D. Carpenter is Professor of Psychological & Brain Sciences, Washington University, St. Louis, USA. Morgan K. Eichorst is a clinical psychologist working within the Veterans Affairs Medical Center, USA.